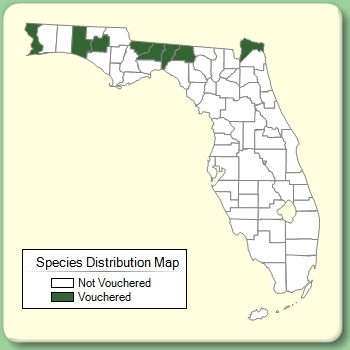 Citation EUPHORBIA PUBENTISSIMA Michaux, Fl. Bor.-Amer. 2: 212. 1803. Agaloma apocynifolia Agaloma apocynifolia (Small) Nieuwland, Amer. Midl. Naturalist 2: 300. 1912. BASIONYM: Euphorbia apocynifolia Small 1898. 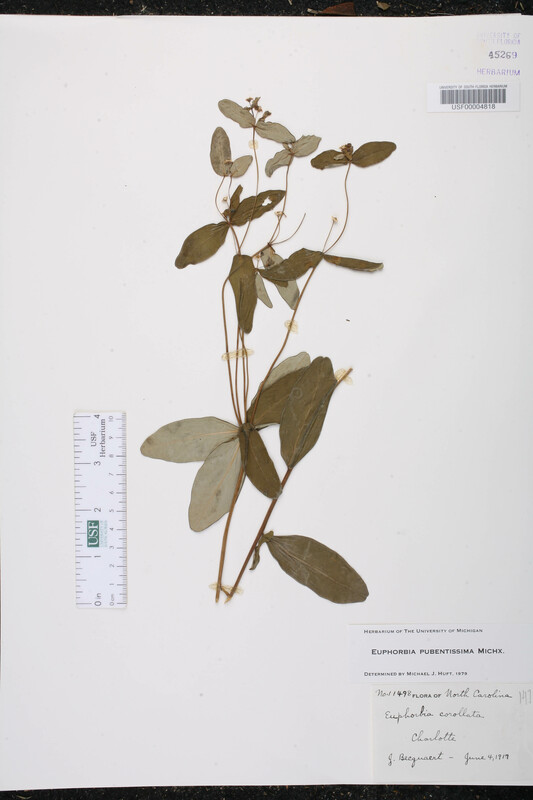 Agaloma pubentissima Agaloma pubentissima (Michaux) D. B. Ward, Novon 11: 362. 2001. 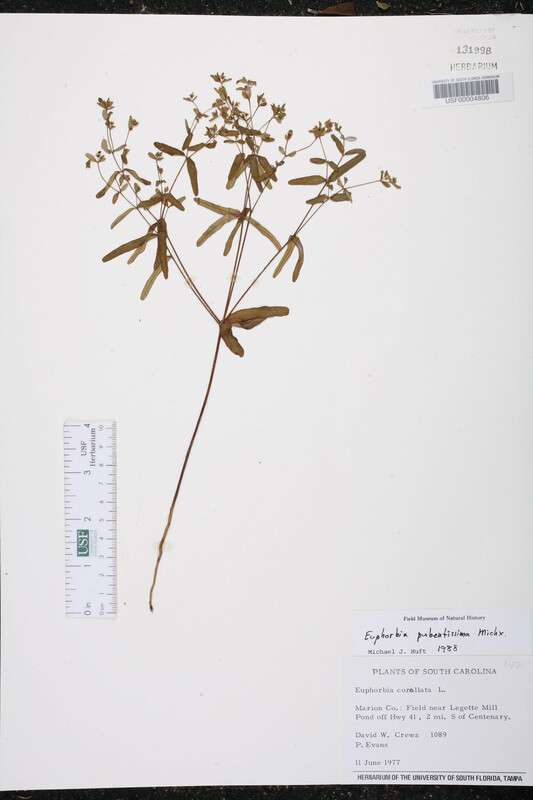 BASIONYM: Euphorbia pubentissima Michaux 1803. Agaloma zinniiflora Agaloma zinniiflora (Small) Nieuwland, Amer. Midl. Naturalist 2: 300. 1912. BASIONYM: Euphorbia zinniiflora Small 1898. Euphorbia apocynifolia Euphorbia apocynifolia Small, Bull. Torrey Bot. Club 25: 467. 1898. 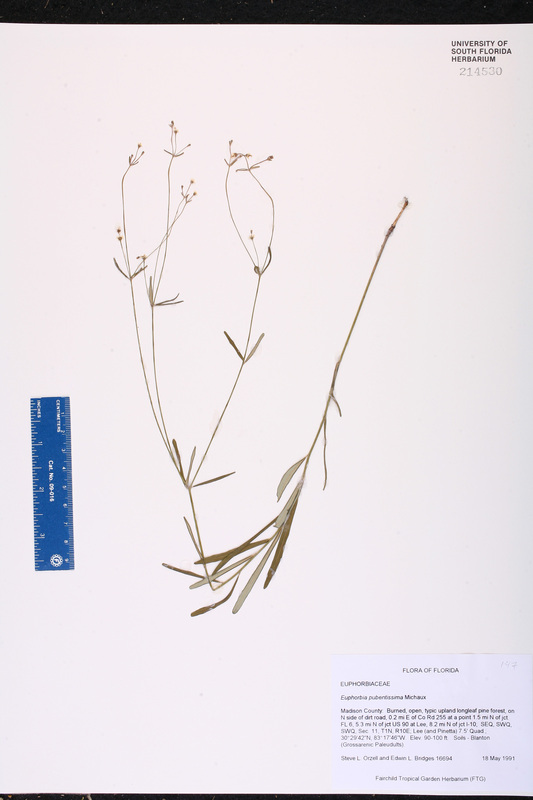 TYPE: FLOIRDA: Gadsden Co.: Quincy, 4 Sep 1895, Nash 2567 (holotype: NY; isotype: F, GH, NY, OS, US). Euphorbia corollata var. apocynifolia Euphorbia corollata Linnaeus, var. apocynifolia (Small) Millspaugh, Bot. Gaz. 26: 268. 1898. BASIONYM: Euphorbia apocynifolia Small 1898. Euphorbia corollata var. zinniiflora Euphorbia corollata Linnaeus, var. 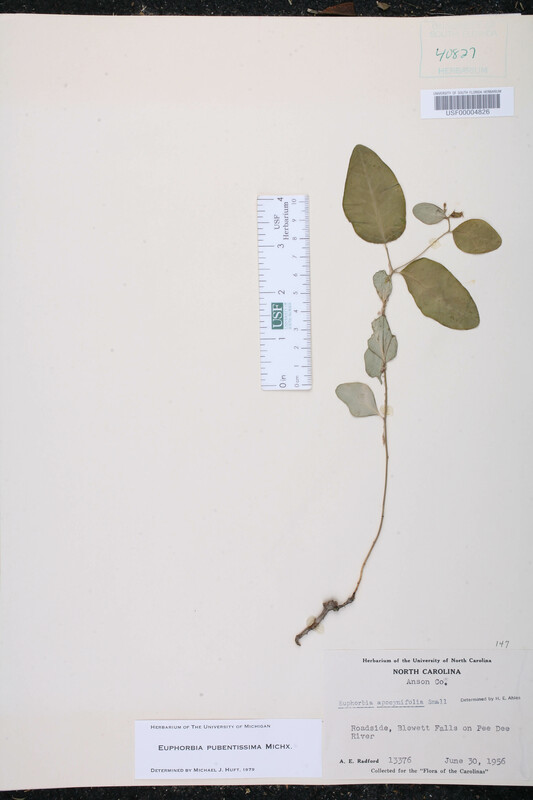 zinniiflora (Small) Ahles, J. Elisha Mitchell Sci. Soc. 80: 173. 1964. BASIONYM: Euphorbia zinniiflora Small 1898. Euphorbia zinniiflora Euphorbia zinniiflora Small, Bull. Torrey Bot. Club 25: 615. 1898. TYPE: GEORGIA: Gwinnett Co.: Yellow River near McGuire's Mill, 7 May 1895, Small s.n. (holotype: NY). Tithymalopsis apocynifolia Tithymalopsis apocynifolia (Small) Small, Fl. S.E. U.S. 717, 1334. 1903. BASIONYM: Euphorbia apocynifolia Small 1898. Tithymalopsis zinniiflora Tithymalopsis zinniiflora (Small) Small, Fl. S.E. U.S. 717, 1334. 1903. BASIONYM: Euphorbia zinniiflora Small 1898. Agaloma paniculata Agaloma paniculata (Boissier) Nieuwland, Amer. Midl. Naturalist 2: 300. 1912. 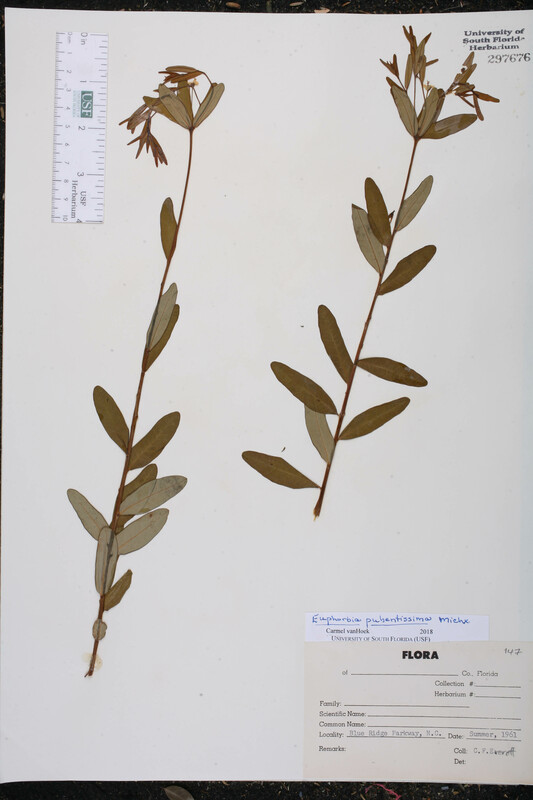 BASIONYM: Euphorbia corollata Linnaeus, var. 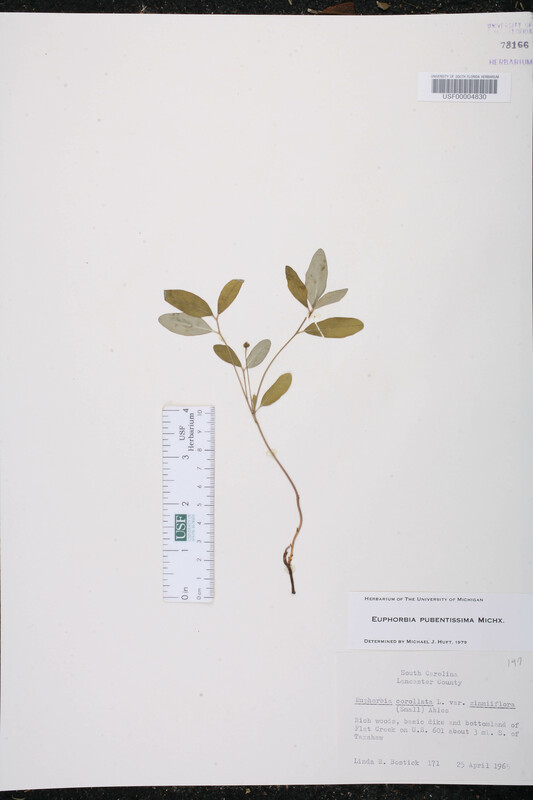 paniculata Boissier 1862; Euphorbia paniculata Elliott 1824, non Desfontaines 1798. Euphorbia corollata var. glauca Euphorbia corollata Linnaeus, var. glauca Millspaugh, Bot. Gaz. 26: 267. 1898. TYPE: ALABAMA: Without data, 1880, Vasey s.n. (holotype: F). Euphorbia corollata var. mollis Euphorbia corollata Linnaeus, var. mollis Millspaugh, Bot. Gaz. 26: 267. 1898. TYPE: ALABAMA: Lee Co.: Auburn, 1897, Earle & Baker 13 (holotype: F). Euphorbia corollata var. 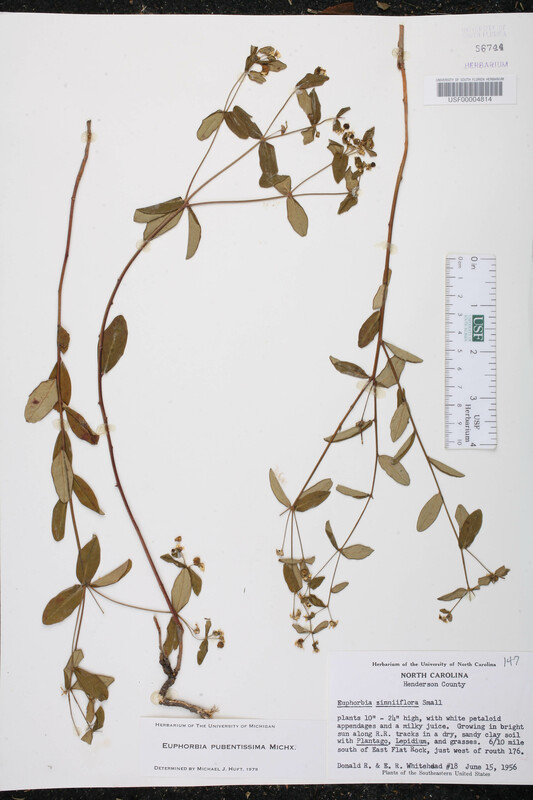 paniculata Euphorbia corollata Linnaeus, var. 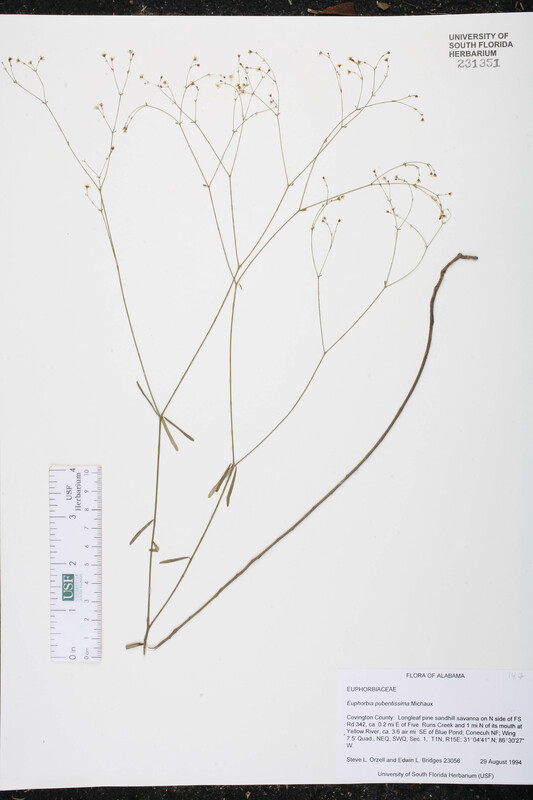 paniculata Boissier, in de Candolle, Prodr. 15(2): 67. 1862. 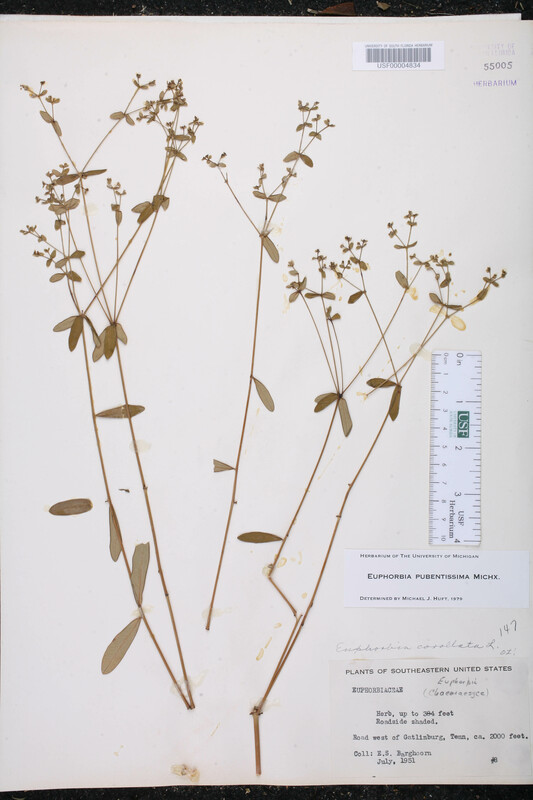 BASIONYM: Euphorbia paniculata Elliott 1824. Euphorbia corollata var. 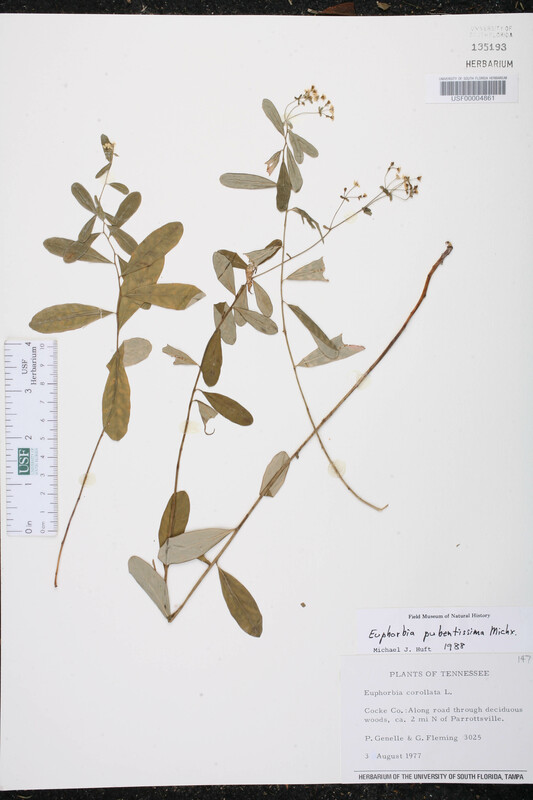 subpetiolata Euphorbia corollata Linnaeus, var. 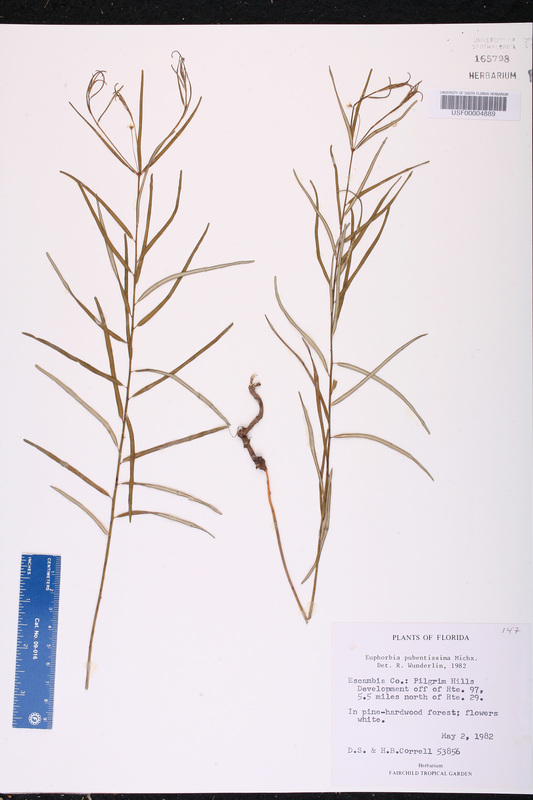 subpetiolata Boissier, in de Candolle, Prodr. 15(2): 67. 1862. TYPE: SOUTH CAROLINA: Without data, Rugel s.n. (lectotype: G). Lectotypified by K. Park, Edinburgh J. Bot. 55: 196. 1998. 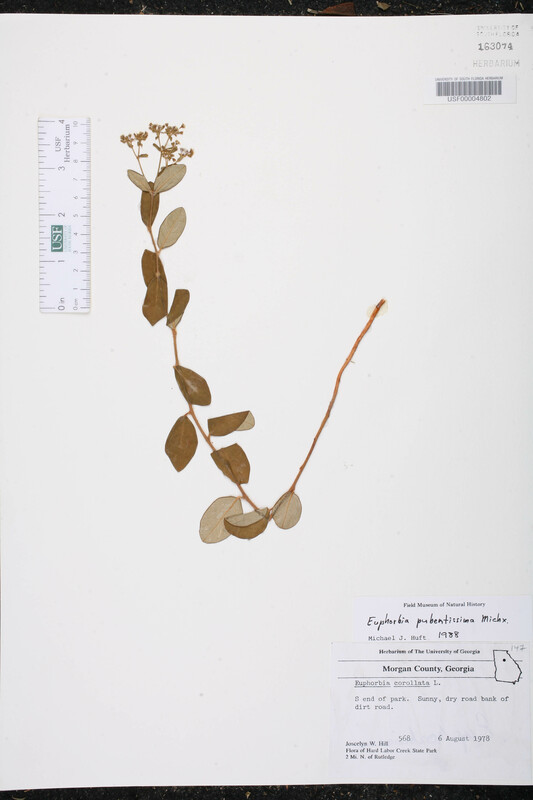 Euphorbia paniculata Euphorbia paniculata Elliott, Sketch Bot. S. Carolina 2: 660. 1824, non Desfontaines 1798. TYPE: SOUTH CAROLINA: Richland Co.: Near Columbia, s.d., Herbemont s.n. (holotype: CHARL). Euphorbia pubentissima var. glabrata Euphorbia pubentissima Michaux, var. glabrata Boissier, in de Candolle, Prodr. 15(2): 67. 1862. TYPE: SOUTH CAROLINA: "Gosborough", s.d., Rugel s.n. 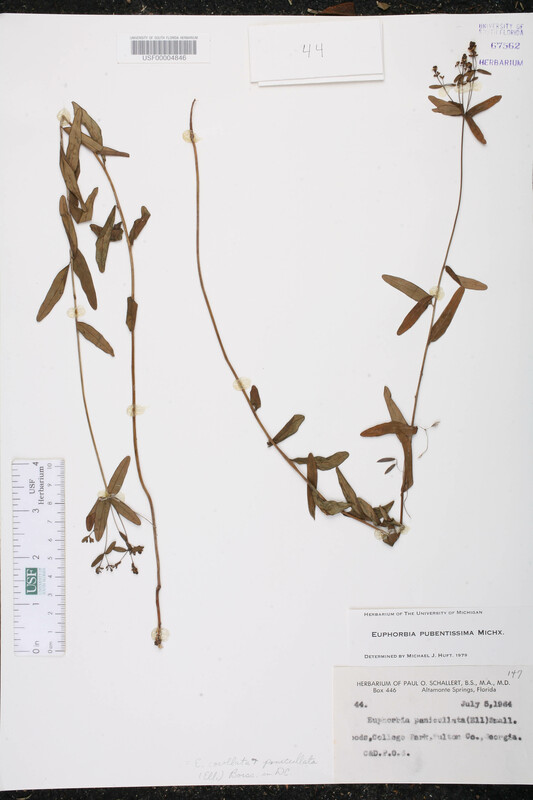 (holotype: G). Tithymalopsis paniculata Tithymalopsis paniculata (Boissier) Small, Fl. S.E. U.S. 718, 1334. 1903. 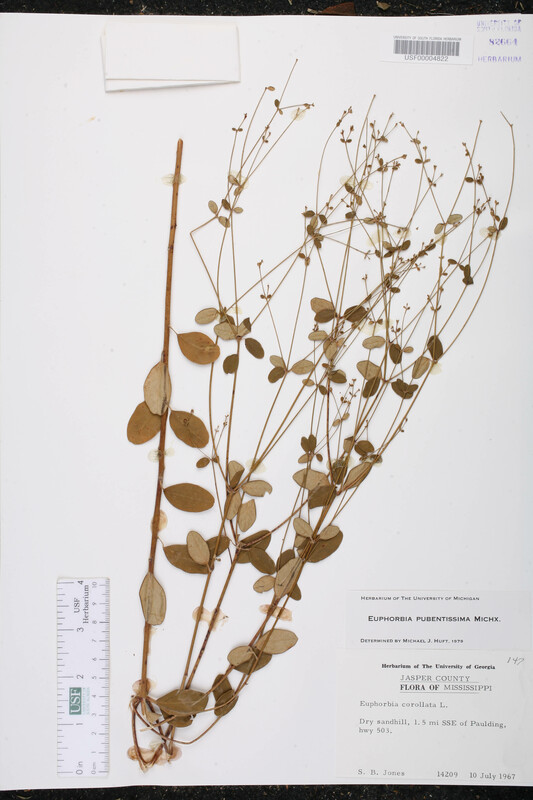 BASIONYM: Euphorbia corollata Linnaeus, var. 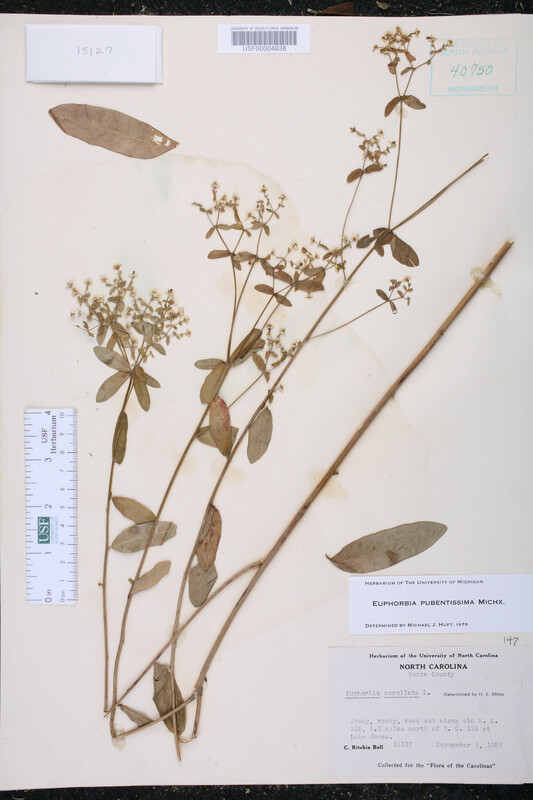 paniculata Boissier 1862; Euphorbia paniculata Elliott 1824, non Desfontaines 1798. USA North Carolina 1961 Everett s.n.